! It’s the latest-greatest uber-cool addition to the famous Instant Pot family. As if looks weren’t enough, this pressure cooker is loaded with easy and customizable functions too. So, I took the ULTRA for a short test-drive to see if it lived up to the hype. Based on that, here is my Instant Pot ULTRA 6 Quart Review. If you haven’t heard of the Instant Pot, let me give you a brief introduction. Instant Pot is an electric programmable pressure cooker that has taken the cooking world by storm. It’s packed with features that not only save time and effort, but also result in succulent and delicious meals. In many kitchens, it has replaced grandma’s old trusted slow cookers, pressure cookers and some other kitchen gadgets too. Sizes & Models: It comes in 3 sizes– 3 quart, 6 quart and 8 quart. Currently, there are 3 models offered: LUX, DUO (& DUO Plus) and ULTRA. The difference in models is the variety of functions each can perform. Before I start my review, I must confess: this isn’t my first Instant Pot, its my THIRD! So, in this review I won’t be discussing the merits of an Instant Pot as a pressure cooker. 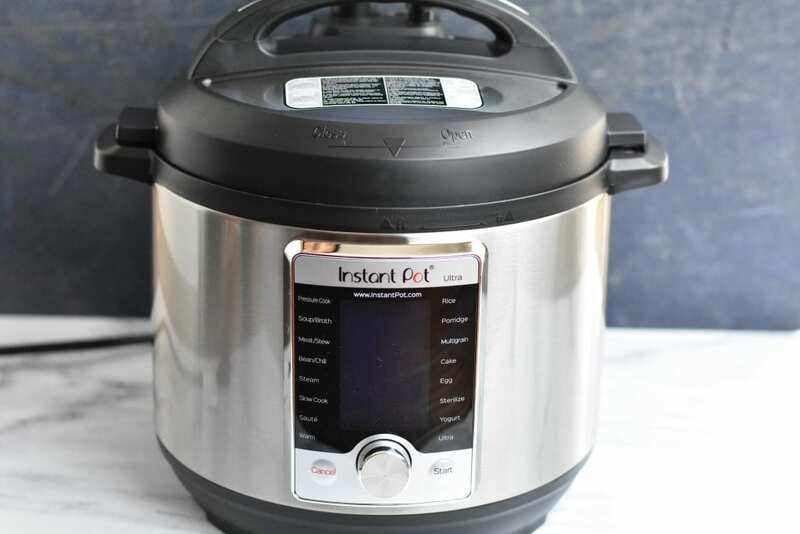 If you’re thinking about getting one and want some basic information on the Instant Pot, read my post on: Why I like INSTANT POT & FAQs ? Many people have found this information useful! Slow Cook – Temperature: High, medium, low , or, Custom (temperature and time). I’ve never used the slow-cook feature, so cannot comment on it. 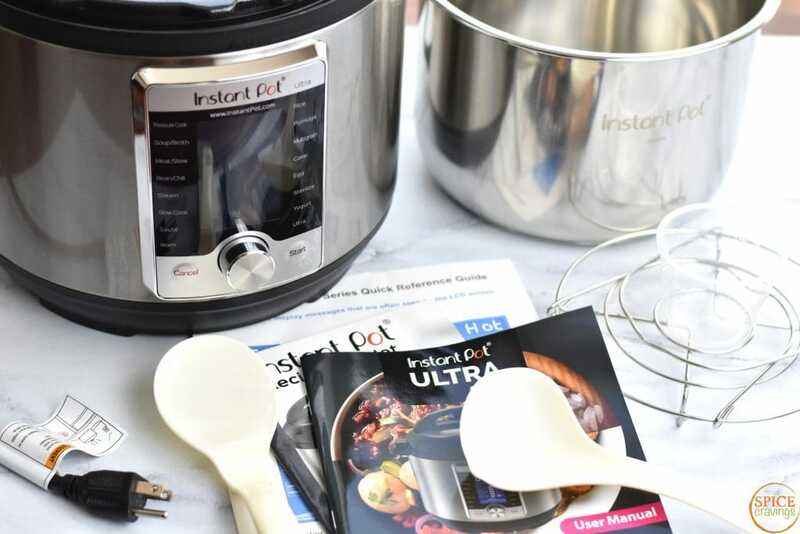 What makes Instant Pot ULTRA, the latest Greatest! The AUTO-SET Pressure Valve is one of my favorite features in the ULTRA. Once I set my time and pressure, I press START and that’s it. 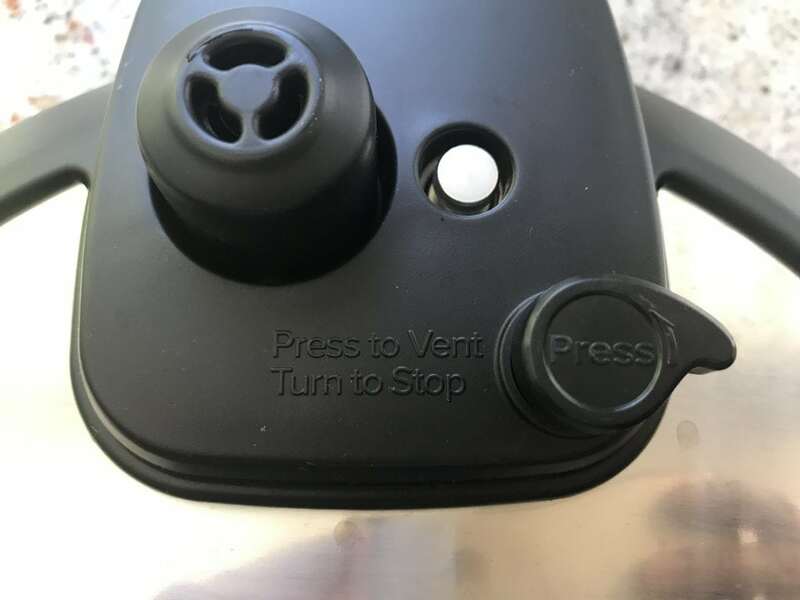 The pressure valve automatically seals and the pressure cooking process starts. LOVE IT! It’s most appreciated by my kids and hubby, who don’t use the Instant Pot on a daily basis, so tendency to forget to turn that valve is way higher. ULTRA has a brand new interface and a cool LCD display that makes it look pretty hi-tech! That’s a good thing right? So, instead of pressing buttons for programs, you have a central dial that you rotate to get to. I have to be honest, when I first started using the dial, I wasn’t a fan. The dial is way too sensitive and I kept going back and forth, trying to get to my setting. I was also comparing it to the convenience of pressing ONE button and selecting the function that I want, instead of having to navigate through the interface till I got to one I wanted. Press the +/- sign till you get ‘8’. Rotate the dial and navigate to “Pressure Cook”, press dial to select it. But after a few days of using it, I was more comfortable with it. It didn’t take me as much time to select the program that I wanted, because I was more familiar with the interface. First time Instant Pot owners won’t experience this learning curve, since they won’t have to unlearn old ways. The Progress Graph is the second feature that I love about the ULTRA. In this new display, once you press START, it displays a progress graph, at the very bottom of the display. The graph let’s you monitor the progress during the 3 stages of cooking- Pre-Heating, Cooking, Keep Warm. I found this feature to be useful as it confirms that the pot is coming to pressure, and then, it’s cooking as it’s supposed to. It’s like a thumbs-up. With the DUO, till the timer started counting down, there was no way for me to find out if anything was wrong. The Instant Pot Ultra allows a user to set in their current altitude at the beginning. Then, it takes care of adjusting to every recipe based on that altitude. That to me is a GREAT feature, considering that most recipes are written for sea level altitude and one has to search how to customize the cook time to suit your altitude. I stay at sea level, so I couldn’t personally test out this feature. So, I asked around on Instant Pot community groups and forums, and got positive feedback from them. Most said that after setting their altitudes, they didn’t have to make any further adjustments to recipes. The cooker adjusted and recipes turned out great. I love features that make things easier for a cook. So thumbs-up for this feature. 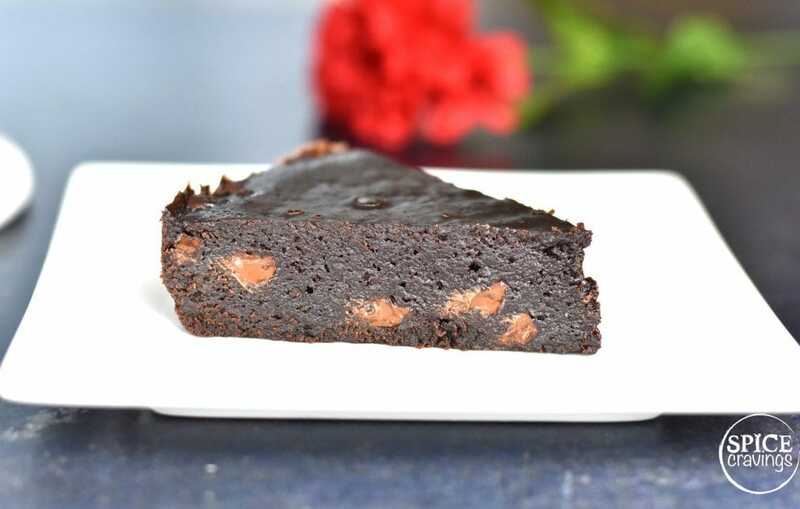 CAKE Setting: Tons of people have been using Instant Pot to bake all kinds of cakes- Cheesecakes, Lava Cakes, Banana Bread and more. It involved a lot of trial and errors till people figured out their own perfect combination of pressure and time. 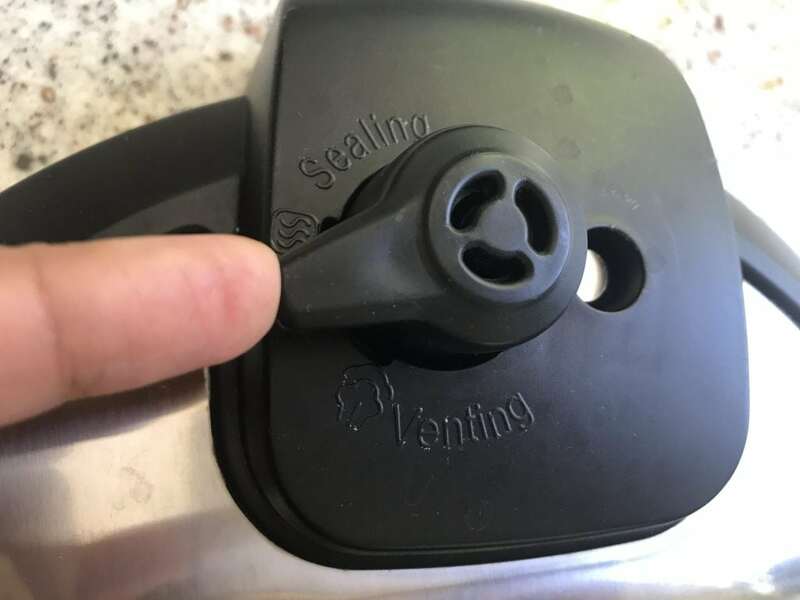 The Instant Pot folks made it easy and introduced the CAKE setting. The default setting cooks at HIGH pressure for 40 minutes. Of course, these settings can be configured to your liking by using the central dial. I must mention here that baking a cake may require you to buy an oven safe pan that fits your Instant Pot. So, to test this setting out, I baked some Chocolate Brownies 🙂 I put a cup of water in the Inner pot and placed the trivet that came with the pot. I whipped up my favorite store-bought brownie-mix and poured it in a 7-inch springform pan. I placed that on top of the trivet, closed the lid. Selected CAKE setting and pressed START. The result was unbelievably moist, fudgy and delicious brownies. So, a bit thumbs-up for this setting. 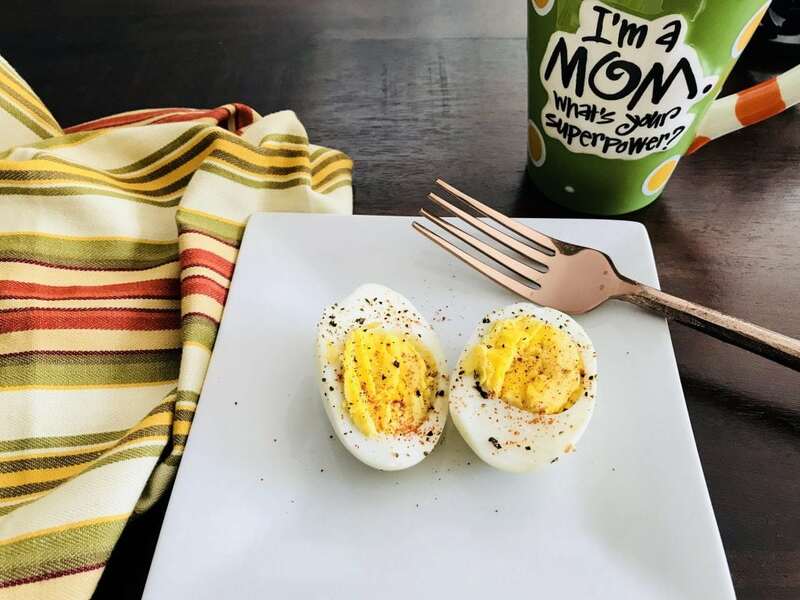 EGG Setting: As you may have already heard, the Instant Pot makes amazingly easy-to-peel boiled eggs. Like they slip off with one hand. That easy. Everyone has their custom time, but for me the 5-5-5 method works. That stands for 5 minutes of pressure cooking time (high), 5 mins wait before you release the pressure, followed by 5 minutes of ice water bath. 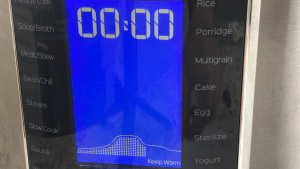 Since this seems to be the most commonly used method, Instant Pot team put an EGG setting for us. The default cooks for 5 minutes at high pressure. And like every other setting, you can tweak it to your liking. 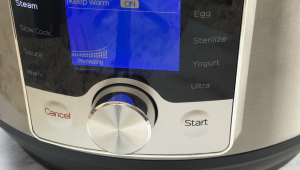 Now, whether you want to boil 2 eggs or 20, you select EGG, then press START. That Simple! I like simple! STERILIZE Setting: I checked the user manual and the website, but couldn’t find enough information about this program. It mentions canning, but there are no specifics like pressure and temperature information. Instant Pot website mentions this, “Instant Pot’s working pressure is in the range of 10.15~11.6 psi“. We know that USDA specifies canning pressure as 15 psi, so none of the current Instant Pot models meet that criteria. I wouldn’t use this feature for canning fruits and preserves. But, it’s good for sterilizing baby bottles and food jars. It’s good to scald milk for making yogurt, but that can be done using the yogurt setting as well. Drumroll please! Now we come to the most advertised function, after which this pot gets it’s name- the ULTRA! It allows you to customize TIME, PRESSURE & TEMPERATURE. So if you want to custom cook your food to a certain precision level (doneness and texture), you’ll like this feature. TIME: You can set anywhere from 1 min to 6 hours. I have to confess, I don’t see why anyone would want to pressure cook anything for 6 hours. Isn’t the whole point of pressure cooking to cook food fast? As an individual setting, to me it’s not that useful, BUT, if I combine that with any of the two below, it can get some amazing results. PRESSURE: You can choose between 3 pressure settings- High Pressure (10.2 – 11.6 psi), Low Pressure (5.8 – 7.2 psi) or No Pressure. I love the No-Pressure setting. It’s ideal for steaming veggies, while keeping them el dente, and also for steaming a popular rice/semolina cake called Idli. If you like to check it out, here’s the recipe for Idli. I can see myself steaming dumplings/Gyozos using this feature. What is Sous-Vide? According to Wikipedia, “Sous-vide is a method of cooking in which food is placed in a plastic pouch or a glass jar and cooked in a water bath or steam environment for longer than normal cooking times at an accurately regulated temperature”. The one thing that comes to my mind when I read that is ‘STEAK’. We all have a certain way we like our steak. 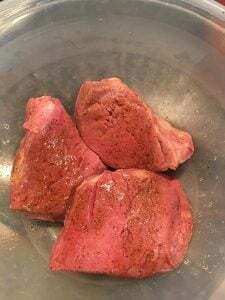 It’s so easy to under or over-cook steaks on the stove or the grill. With this technique, one gets a uniform cook from edge to edge. I got some amazing feedback from a friend, Gayle Bell, who is also a moderator for an Instant Pot support group, Instant Pot 101 for Beginners. 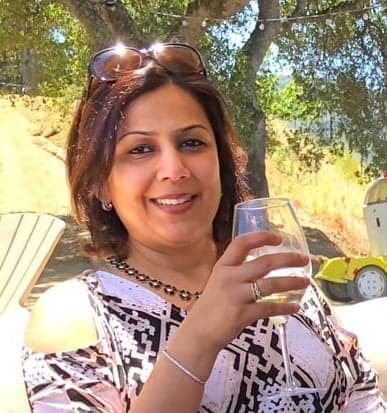 She owns 4 ultras, has cooked with this technique multiple times, so you can say she knows what she’s talking about 🙂 She cooks a New York Sirloin or Filet Mignon using 129F temperature, for 1.25 hours, then browns it in the same pan. She was kind enough to share some of her pictures for this review. Check them out, I couldn’t stop drooling! 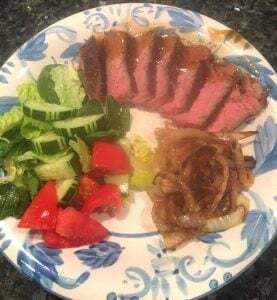 After seeing the results and talking to people who use the ULTRA setting for Sous Vide, I would give it a thumbs-up. I can see my husband using this feature a lot. 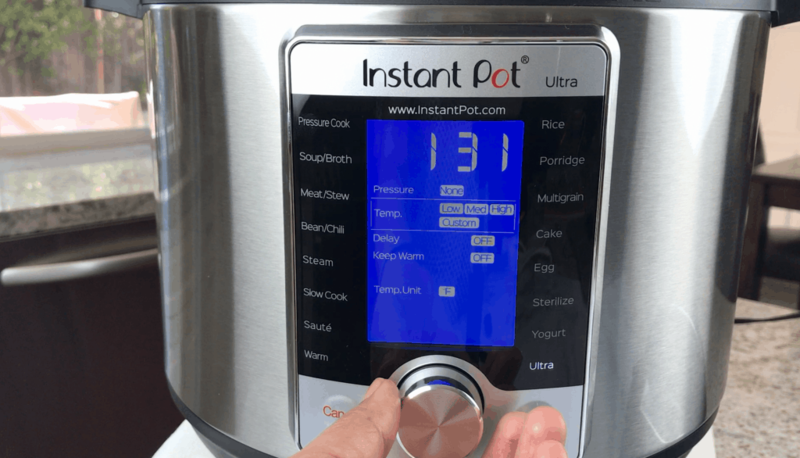 Conclusion: Instant Pot ULTRA 6 Quart Review. The new pressure valve & steam release re-design is a welcome change. 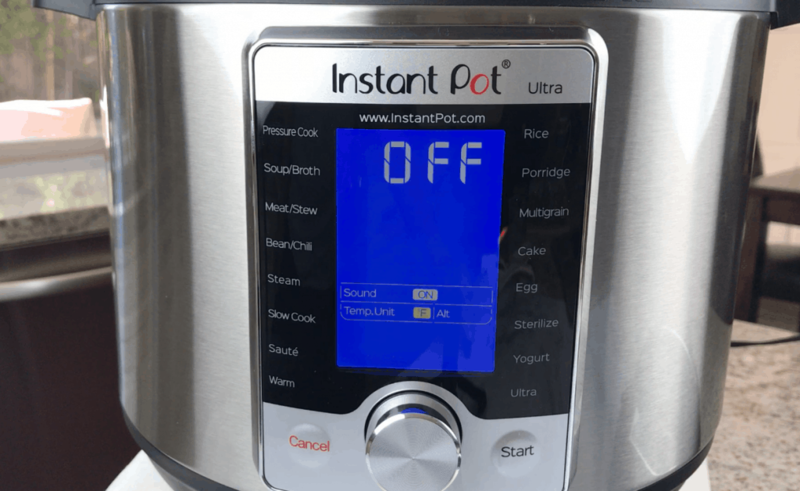 In my opinion it is the best feature that makes it the best Instant Pot so far. I like that the steam release valve tilts away from you when releasing steam. So much safer when my kids are operating it. The addition of a START button. It’s just logical to have a ‘start’ button after you’ve selected your settings. No more wondering if it started or not. The progress graph is a great addition. It gives me a visual update of the progress in different stages of cooking. The ‘altitude’ setting auto adjusts for recipes, which is great. 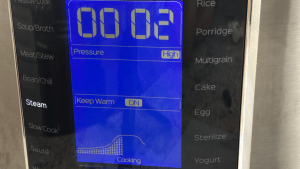 You set your current altitude once and the cooker adjusts for all recipes. That makes things so convenient vs. having to adjust individual recipes. I like the addition of a ‘cake & egg’ button. For new Instant Pot owners, it’ll take the guesswork out in recipes. Not sure how much use people will get out of the ‘sterilize’ button, other than sterilizing baby bottles. The ‘ultra’ feature looks promising. 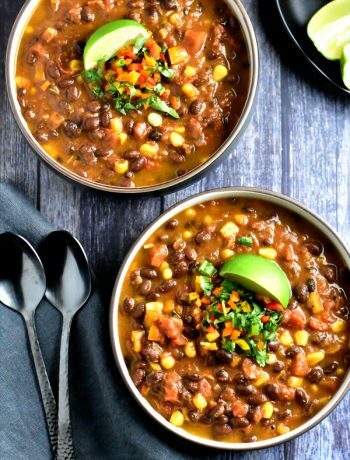 I wish more information and recipes were published by the Instant Pot Company, so we can maximize this program. To me, this is a great pressure cooker to buy. It was a great upgrade from my DUO 7-in-1.